A ferry boat [on the Hooghly]. 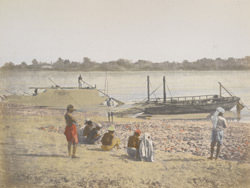 bl.uk > Online Gallery Home	> Online exhibitions	> Asia, Pacific and Africa Collections	> A ferry boat [on the Hooghly]. A hand-coloured print from the Fiebig Collection: Views of Calcutta and Surrounding Districts, taken by Frederick Fiebig in 1851. Local ferry boat ghat (landing-stage) on the banks of the River Hooghly, at an unidentified location. The River Hooghly is the most westerly and commercially important arm of the Ganges. Calcutta was founded in 1690 by the British East India Company on the banks of the Hooghly and the port grew to provide access from the sea to the hinterland of Bengal, India’s richest province. The Hooghly carried to the sea a large volume of exports brought to Calcutta by the railways and river steamers and through the river also entered a large number of imports. One of the largest exports was jute as Calcutta became the world's largest processor of jute. The jute industry was established in the 1870s, and mills extended north and south of the city centre on both banks of the Hooghly River. Warehouses built along the river were once the lifeline of the Raj’s trade and commerce. Boats that plied along the river ranged in size, from small fishing vessels to ships engaged in intercontinental trade docking at Calcutta Port. There were also many passenger steamer services on the Hooghly, carrying people to the numerous settlements on the river banks.